The great thing about being retired is enjoying that special time of day that you don’t even seem to notice when you are rushing about for work. For most of our lives, we go to bed looking at the clock, setting it to make sure we wake up in the morning on time, then rolling over and looking at it during the night, then hitting the snooze a couple of times convincing yourself you have a few extra minutes, then jumping in the shower and dashing around running late to work. That’s something that is not sitting in our bedroom any longer, no alarm clock in sight to stare at in the night. If there is something to get to early the next morning, I just set my iPhone and let it wake me from another room. Even the dogs are learning how to sleep in a bit. Once the room starts getting light, it’s time for coffee on the patio, watching the sun come shining through the leaves on the trees, still low in the sky. This is that special time of day that most working folks miss out on until the weekends, when they finally have a chance to sleep in and may still miss out on the early morning pleasures of being outside. Listening to the birds softly singing but not in sight yet, still perched high up in the trees. 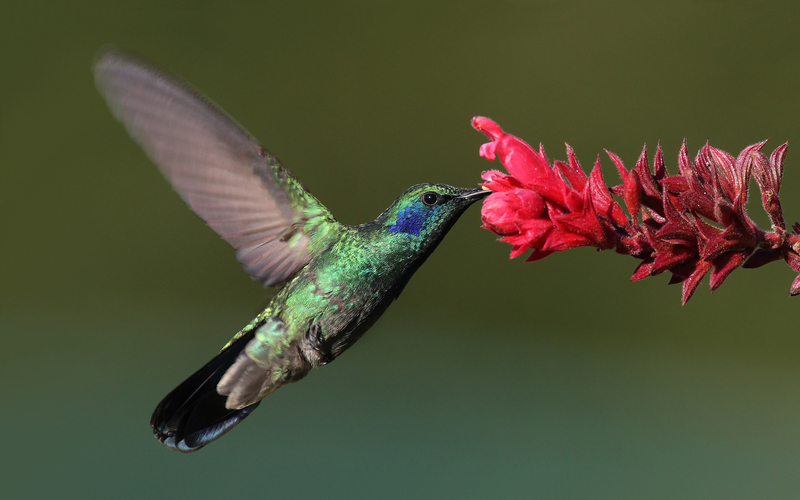 And as the sun comes out, we watch the hummingbirds swoop and dip and flutter as they start their playful morning, coming in for a sip of sweet sugar water, or taking long slurping little drinks from the fountain with their tiny straw-like beaks and tongues. I never even knew that hummingbirds would drink from a fountain, but found out in these early mornings that they only drink from running water. They enjoy early morning baths in that bubbling aqua, splashing around, never standing still for a moment as their little wings flutter during their spa time. Our dogs love being outside, running around the yard, smelling the fresh air and stumbling through the flower beds, trying to figure out where the birds are hiding out in the early morning. Bristol, the male with the bad back who struggles to walk at times, completely forgets about his pain during his outside morning adventures, trotting around lightly on his feet and actually lifting up those back feet for a short time, acting almost like a puppy. 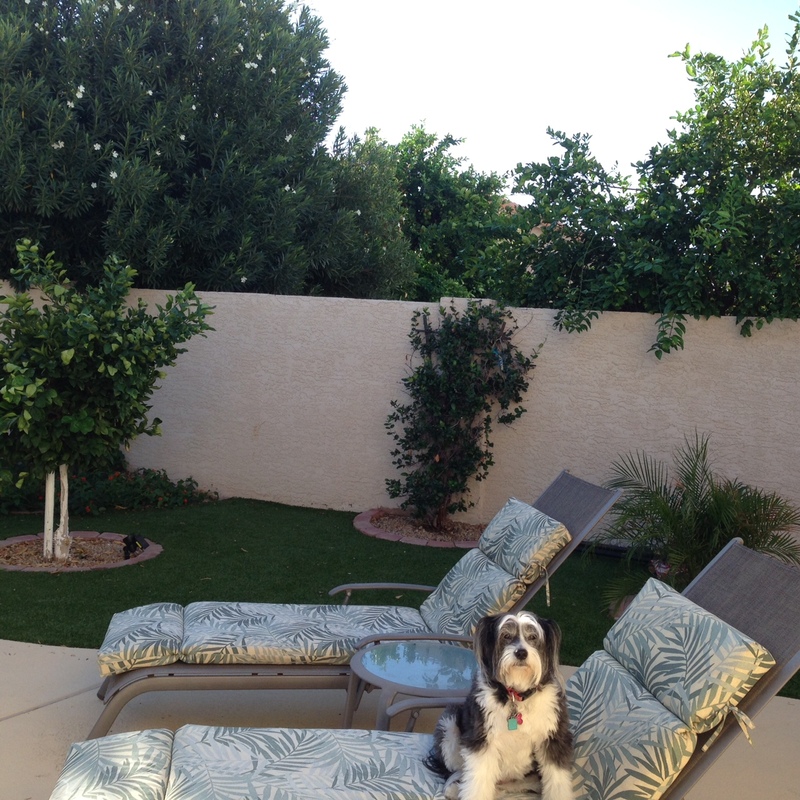 Or our other dog Mollie, enjoys sitting on the chaise lounge, watching her crazy brother run around, bird watching. If he starts to get into trouble, you can bet that she’ll run over and paw at us, letting us know he’s doing something he shouldn’t be. It’s amazing what a little fresh air, blue sky, birds singing and a cool fall day can do to rejuvenate us after a long hot summer. Enjoy the early morning, so full of special simple pleasures and find out what you were missing out on all those years of rushing off to work.